Who knew getting lost in the subway could be so absorbing. Mild spoiler warning: This story features details on the events that transpire in the opening couple of hours of Persona 5. Literally up to maybe hour two, and nothing more. The first time Persona 5 really lets you loose in its world, you’re tasked with navigating Tokyo’s subway system. “Find the Ginza line,” you’re told plainly, with zero waypoints on the mini map. The only thing guiding you is your eyes, physical signs, and a sense of confused, terrified wonder. Our hero, we learn, is new to Tokyo. He’s been cast there via his parents' friend of a friend, an alleged regular customer at the perpetually grumpy Sojiro Sakura’s local cafe. Our protagonist has been stuffed into the dust bunny-ridden attic of Sojiro’s Cafe Leblanc, left to reside in Tokyo for the remainder of his probationary period. This is because due to “physically assaulting” (re: stopping) a man who attempted to sexually assault a woman, our protagonist is arrested, labeled the “bad guy” by adults everywhere, and expelled from his former high school. And now here he is in Tokyo, at the only school that would bother to take him in (under the pretense of attaining a “good reputation,” y’know, for ideally “reforming” this criminal student). Getting purposefully lost is something games don’t often bait the player to do. Games live and die by their structure, hand-holding, and simple guidelines to direct players. There are creation-oriented games that break this mold—Minecraft, of course, comes to mind—but even then, there’s always a light objective in mind. But Persona 5’s goal feels awfully more purposeful. The main character is lost following a disorienting series of life-altering events, just as he is in this very subway station. He’s a new soul in Tokyo who has failed to learn the exact twists and turns that await him on his newfound daily commute. And you, the player, are lost as well, exploring the labyrinthine Shibuya Station and beyond for the very first time, patiently waiting in line before entering a train. Thanks to a block on natively capturing screenshots, a lot of images are relegated to its Japanese version. My apologies. 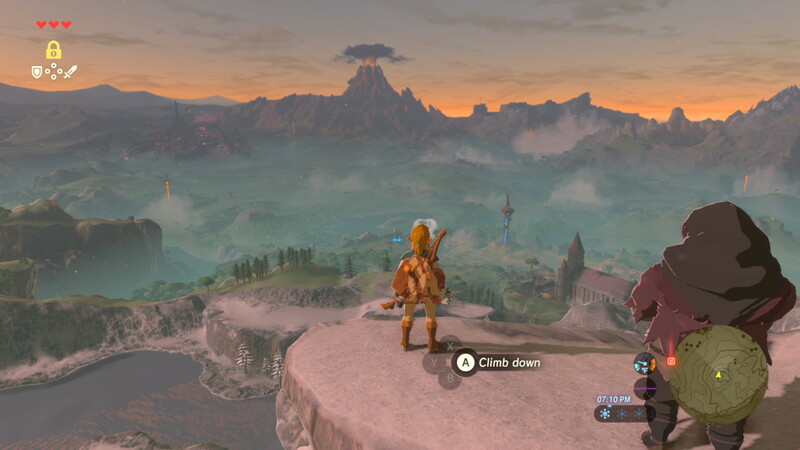 Recently, in Nintendo’s The Legend of Zelda: Breath of the Wild, the familiar hero Link is quickly cast out into the grand, desolate land of post-apocalyptic Hyrule. As soon as he’s equipped with the ever handy cloth paraglider, a mission tagline appears above Link: “Defeat Ganon.” I’d be lying if I said I didn’t snort upon seeing this, but as Link glided off the isolating Great Plateau for the first time, I realized just how damn big Hyrule was. And with that, I rushed off in the direction towards the first tower the eye could behold. Breath of the Wild is a game built on the crux of getting lost and exploring the world around you, and rewarding you endlessly for the childlike curiosity. Persona 5, in its opening hour, postures the player to get lost in a similar way. Find the Ginza line, but don’t depend on the game to tell you where that particularly is. It’s as if the game is holding up a middle finger to my expectations, and saying, “find it yourself.” So we go. Or try to, that is. We walk in circles around Shibuya Station. I talk to a lady selling juice, my internal monologue just notes that I should be hurrying to school. I eavesdrop on commuters talking about the recent subway accidents, incidents where conductors lost control and crash trains, injuring people in the process. Persona 5 establishes our lost, confused hero simultaneously with a lost, confused Tokyo, which is battling with a series of catastrophic events. Eventually, we find our way through Shibuya Station. We hit a roadblock, find another way around, which emerges us into the light of Shibuya Square. The skyscrapers tower high, all spotlighting flashy advertisements. There’s a faux-Hachiko statue, honoring a dog that loyally waited for his owner everyday at Shibuya Station, even long after the owner had passed. After the dim, dizzying maze of Tokyo’s train system, we’re gifted with our first real view of Tokyo uninhibited by a cutscene. We’re free, and yet we’re still so, so adrift. In an interview with Wired last year, Breath of the Wild director Eiji Aonuma was worried about casting off the series’ carefully structured design sensibilities. “I thought that making the user get lost was a sin,” he said. But like Persona 5, Breath of the Wild succeeds in establishing its story by disorienting the player through its action. In Breath of the Wild, the world and your memories are a complete mystery, left for you to behold yourself. 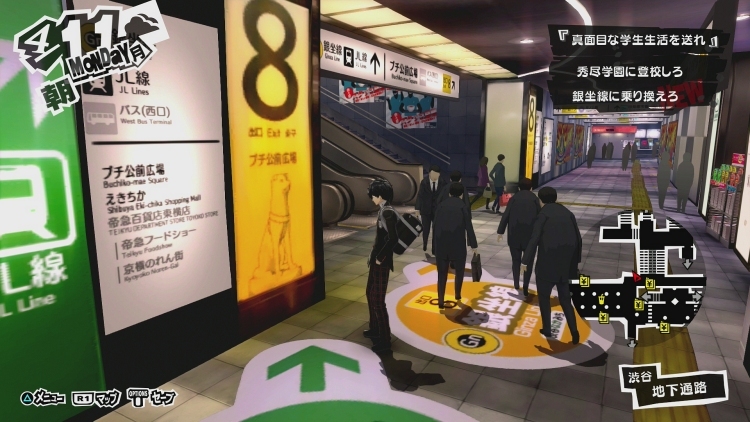 In Persona 5, Tokyo is a foreign entity to the hero and the player, manifested by getting lost in an underground concrete jungle and eavesdropping on the commuters of a Tokyo in worrisome turmoil. The Ginza line isn’t far away from Shibuya Station’s center. We waltz in there, flashing our commuter pass like we didn’t just get lost navigating a subway station for far longer than needed. Then we enter a station platform once and for all to hop on the connecting train to school. At the end of our turmoil, we have nearly reached our destination. And by the end of it all, I feel a bit closer to the hero I’ll spend another 100 hours with. And what a glorious 100 hours they end up being.